If you are passionate about the pure sour and sweet of pomelo, “goi buoi tom” is definitely what you are seeking for as a good appetizer in summer days. The recipe begins with pomelo flashes that are already removed the out skin and separated dedicatedly into individual teardrop cells. Like other Vietnamese salads, shrimp is boiled, deveined and halved while cilantro, mint, coriander and other herbs are coarsely chopped and pickled carrot is julienned and drained. 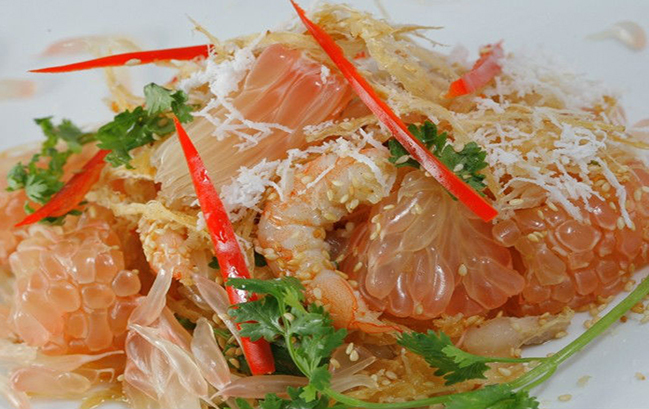 The concoction of shrimp, carrot, veggie, chili, sweet-sour fish sauce is mingled together, placed into the pomelo cover and topped with fried shallots. The dish is commonly decorated with flower-shaped chili at the top and eye-catching pink shrimp around. It is often served with Vietnamese shrimp chips. Apart from the gentle aroma of herbs and pomelo, the remarkable blending of flavors, a little tart, a little sour, a little sweet, a little bitter along with a little pungent, are certain to whet your appetite. The dish is not only fresh tasting but also light, and healthy. Have you ever tried Xoi Trung Kien - steam glutinous rice with ant egg?